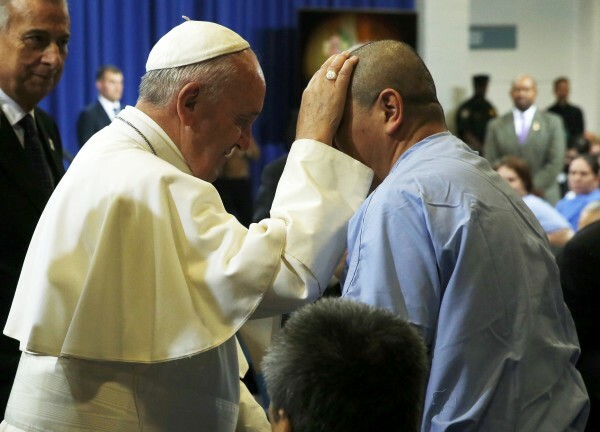 Pope Francis blesses an inmate as he meets with prisoners at Curran-Fromhold Correctional Facility in Philadelphia, Sept. 27, 2015. Pope Francis was met with near universal praise during his U.S. visit as he called on us all to work together in charity to address the challenges we face as a nation and world. Then word came that he had met with Kim Davis during his visit. The Internet did not welcome the news. It led to a strange realization. The Pope can meet with Philadelphia prisoners accused or convicted of breaking various laws and receive praise. Yet his meeting with a woman who was jailed for ignoring the law is derided and ridiculed. Why are the former worthy of mercy and encouragement but not the latter? That is not to say Kim Davis’s actions were correct — they weren’t. If you are an officer of the government, your oath is to uphold the Constitution and the system it creates. Once the court rules, you abide by the decision. If you think the decision is wrong, you work to change it through statute, constitutional amendment or judicial appointment. If you cannot do that, step down. But this dichotomy — only certain jailed people are worthy of visits — illustrates one of the biggest challenges for those who attempt to paint Francis as a “ socialist” or “ caveman.” The reality is the Pope remains Catholic. And the Catholic faith historically has not been well understood or well liked in this country. Anti-Catholic slurs were prevalent during Maine Sen. James Blaine’s 1884 presidential run, while John F. Kennedy felt the need to publicly distance himself from his faith in his 1960 presidential campaign. Some of the largest Ku Klux Klan rallies occurred in Maine, opposing Catholics and attempting to prevent them from engaging in public life. A lot of Catholics scratched their head at this phrasing. Haven’t priests always had the ability to forgive sins? If you read deeper, you would see the Pope’s pronouncement applied in a limited number of dioceses, where there was an additional step to absolution involving the local bishop, himself a priest. The change really amounted to Catholic regulatory reform, but you would not guess that from the coverage. There have been numerous other miscommunications in reporting on the Pope, which can be chalked up to difficulties in translating from Italian, Spanish, Latin or other languages, as well as the 2,000-year-old context through which Church teachings must be viewed. By itself, this would be nothing more than a passing problem. But there has been merger of politics and faith this political season, with politicians wrapping themselves in the Vatican flag to glom onto Francis’ star power. You saw it with Bernie Sanders, who almost immediately sent out fundraising emails quoting portions of the Pope’s speech before Congress — though Francis actively omitted the words ascribed to him. Sanders constantly references the Pope’s teachings and holds him up as a great moral teacher. Yet when it comes to abortion, the Vermont Senator dismisses the Pope’s message out of hand. You saw it with the president and with public praise for the Pope’s teachings. Yet President Barack Obama ignores the Pope’s visit to the Little Sisters of the Poor, a Catholic charitable institute. They also happen to be suing the Obama Administration over the president’s signature achievement: the Affordable Care Act. Some Republicans are no better. Donald Trump’s praises the Pope as humble and “just like him” while simultaneously crowing about a $10 billion net worth. Francis said clearly “business is a noble vocation … especially if it sees the creation of jobs as an essential part of its service to the common good.” It seems Mr. Trump believes nobility in business is derived from money. There is a level of confirmation bias with all these candidates claiming Francis as their own. It is compounded by misunderstandings of his pronouncements perpetuated by the press. And it leads to shock when he does things out of the character others have invented for him, such as meeting Kim Davis. Many will state they have the Pope’s imprimatur on their policy. With a few exceptions, they do not. Politicians will try to align themselves with Francis because he is more popular than them. It is a natural tendency but one most voters hopefully will see for the charade it is. The simple fact is the Pope is not a Republican or a Democrat. He isn’t pro-choice or a supporter of gay marriage. He believes mankind has a duty to steward the environment and that we have moral obligations to one another that may or may not be best addressed through government. In short, the Pope is Catholic. Whether he meets with Kim Davis or Philly prisoners, he does not really care what we think about him. He just wants us to pray for him, and we should.